On February 14, Laymon died of a massive heart attack, at age 54. His death carried a particular poignancy because of late, after several years during which he couldn't find an American publisher even as his books climbed bestseller lists in England and Australia, he was enjoying a comeback here, with his current and backlist work being issued by Cemetery Dance and Leisure Books (e.g., his novel The Last Vampire, published by CD in 2000). 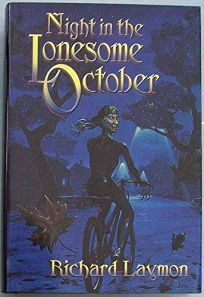 Some of Laymon's problems with American publishers arose from the downturn in the horror market in the '90s; more came from what many considered excess sexual violence in his books. The poignancy of his death shades into irony because his first posthumous publication (there are more to come) not only features less of the sexual violence that in fact did mar some of his books but also highlights his tremendous strengths as a writer. This is at once one of the eeriest, and one of most immediate, horror novels of recent decades. It details what befalls a lovesick young man as he wanders on successive nights through his college town. Ed Logan, 20, just ditched by his long-term girlfriend, takes a seven-mile walk late one night from his apartment to Dandi Doughnuts—the first steps in an odyssey that finds him mixing with a new girlfriend, cannibals ("trolls") living underneath neighborhood bridges, a gay college student with the hots for Ed, violent or potentially violent sexual predators both male and female and, most memorably, a fellow night-traveler: an 18-year-old homeless girl named Casey who teaches him to embrace the wonders and terrors of the night. The novel unfolds like a series of dreams—some nightmarish, some amusing, some wet—and is related in the extreme detail of moment-to-moment narration that allows Laymon, at his best as he is here, to plunge readers fully into the alternate reality of another's experiences. Due special praise here are the visceral truths of young adult life that Laymon plumbs in his characters. But above all, this novel, like so many of his others, is just good old nasty fun to read; it's a traipse through unknown territory, with jack-in-the-boxes of all sorts lurking just behind the next shadow or page.